Leco Plastics, Inc. was founded in 1946 and is now operated by second and third generation management. 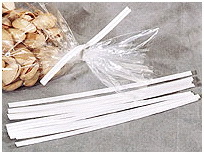 We are the leading manufacturers of cable ties, nylon ties, plastic ties, zip ties and plastic handles. Samples of items listed in this catalog will be sent on request. Allow Leco Plastics experience to work for you on your next project. We will be glad to provide you with a prompt quote and information. Leco Plastics, Inc. is able to build from scratch custom electro-mechanical, pneumatic production equipment as well as modified stock packaging equipment to automatically insert our products. From the design stage to the prototype stage to the production stage,Leco Plastics will work both in-house and on site for you automated packaging concerns. We are an all-inclusive, "one-stop-shop", accepting orders to manufacture from scratch custom electro-mechanical, pneumatic production equipment as well as modified stock packaging equipment to automatically insert into our products. From the concept stage to the design & prototype stage, we will work both, in-house and on-site, for your automated packaging needs.